Feature Artist, Kathleen Hadley hails from rural Northeast Iowa where she attended very small schools that stressed excellence in the basics. Her education gave her a strong work ethic and a desire to succeed. As a child her exposure to the arts was limited, although there was a touch of inspiration in her art projects. Kathleen graduated from the University of Northern Iowa (UNI) with a teaching degree in Art Education and a minor in English. Years later, Kathleen attended New Mexico State University, earning her Master’s Degree in Reading and Curriculum Instruction. While an undergrad at UNI, Kathleen discovered her love for the arts and Art History. A required “Fine Arts” course as a freshman introduced her to the tantalizing world of Art. She majored in Art with the emphasis on Art History. Art History classes were mesmerizing to her. From Prehistoric, Egyptian, Greek, and all the European Arts and Architecture classes, she gained a thirst to travel and study art. She wanted to learn about the societies that created these masterpieces. It was fascinating to follow the civilizations through both art and literature studies. Though art history was her primary interest, as a teaching major, she also spent a significant amount of time in classes focused on education and other required curriculum. A course in 19th Century Art was her last history class, but she still had not touched any 20th century, Contemporary, or American Art. Instead, she would pursue those topics via self-study as she taught. For over 23 years Kathleen and her husband, a Chaplain in the U.S. Air Force, traveled and lived in places around the world. When her three daughters were toddlers in Ohio and California, she was able to reconnect with the art world by taking classes in watercolor painting, and drawing. In most places, she was able to teach, but she was always catching up the various teaching requirements of each state and found herself constantly in school. In New Mexico, she traveled 77 miles one way (across the desert) to get an additional Elementary degree and a Masters in Reading and Curriculum and Instruction. From Ohio to California, Germany, New Mexico, South Carolina, Texas, Alaska and then finally at their last assignment in Mississippi, Kathleen always either taught Art or Title 1 Reading. While living in Germany, Kathleen got to fulfill her dream of visiting historical European cities and museums. She and her family lived among the whispers of history and breathed the air of the ancients. Living in Europe emphasized to her the importance of art in recording the history of civilizations and mankind. She would drag her family from castle to castle or from quaint village to scenic vistas on the Rhine or the Mosel Rivers. From experiences like these, her daughters gained a deep appreciation and love of the arts, which they now share with their own families. The beauty of Alaska, especially in the winter, was awe-inspiring! It was so exciting to meet so many wonderful artists and share ideas. After her husband’s retirement from the Air Force, Kathleen and her husband moved to Fairfield Bay, Arkansas. Kathleen began work at Shirley Elementary School in 2004. She treasured her position as she found young students who were so very receptive to creating and loving art. Challenged to help the school by encouraging “parental involvement”, she decided to have ongoing displays of student work throughout the school hallways. She created special Christmas Art Shows at the Indian Hills Country Club in Fairfield Bay each December. In cooperation with the NCA Art Gallery, she hosted a reception for the students and their parents. As word spread each year, parental involvement and attendance grew. She had a school wide K-6 art display on all the walls at the school – again inviting parents for an open house reception at the end of each school year. It was an opportunity for children to see one or more works of their works matted and hung on the wall gallery style. Teaching elementary children was remarkable for Kathleen. For so many young children, creating art was pure joy – it was freedom of expression in its purest form! Kathleen remained at Shirley until her retirement in 2010 to spend more time with her husband, daughters, her grandchildren, and their families. Over the years, Kathleen has been mesmerized by the skill and quality of the artists who came to give workshops at Fairfield Bay. The local art displays are also inspiring. The greatest thrill in creating art is the constant change. Kathleen has found this part of the US blessed with amazing museums in Tulsa, Little Rock, Memphis, and now Crystal Bridges. Kathleen’s personal art journey keeps evolving. With all the exposure to such a wide breadth of media, she still is inspired by the stunning beauty of the area here in Arkansas, and by the talented and wonderful artists she now calls friends. Watercolor painting is still a favorite, mainly because of the spontaneity, the “happy accidents” or surprises one can sometimes create. 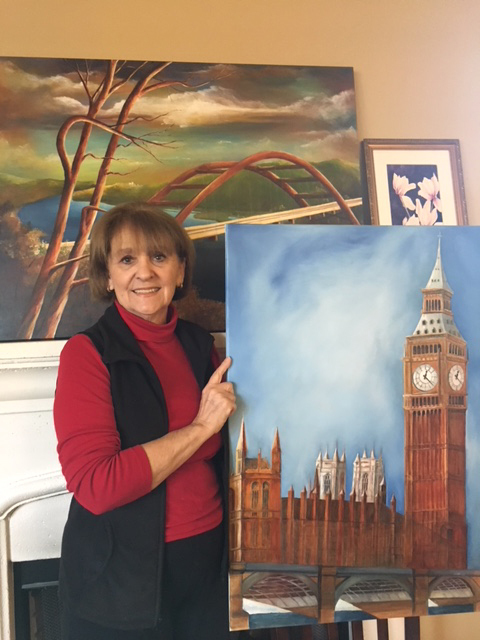 Though she has in the past worked with Acrylics for large paintings she recently had the opportunity to paint with her daughter, an accomplished artist in Michigan, in her daughter’s preferred medium, which is oils. Kathleen found that the color of oils seem to sparkle a bit more – definitely a future possibility, perhaps in another workshop. Kathleen states that her biggest challenge is to free up brush strokes and attain that fresh pop of paint that jumps off the canvas or paper. Going forward, she wants to devote more time to studio work and focus on growing her art world. The North Central Arkansas (NCA) Art Gallery Mission is to bring quality Fine Art to our community with good taste & family values. The artists are professionals as well as emerging new artists. The artwork is open to all Artist and chosen by a selection committee under the direction of Art Coordinator, Charlotte Rierson. Art Gallery hours are Mon. Thru Fri. 9:00-4:00 unless special events or conferences then the hours will be extended. The viewing of the Art is open & free of charge to the public. All art is available for purchase. The NCA Art Gallery is sponsored by the North Central Arkansas Foundation for the Arts & Education (NCAF&E) and The City of Fairfield Bay. For more information about the Art Gallery contact NCA Art Coordinator, Charlotte Rierson-501-884-6100, email [email protected] or Conference Center Directors, Wilba or Bob Thompson- 501- 884-4202, 110 Lost Creek Parkway, Fairfield Bay 72088. Deliver Artwork to the NCA Art Gallery, Conference Center, 110 Lost Creek, Fairfield Bay. A selection committee will select the Art. Be withdrawn on or before the close of the Exhibition. 5. Outside Frame Size: minimum 12 inches & maximum 40 inches any direction (except for photography). 6. Artist statement-no more than 2 paragraphs. 7. Artwork exhibited in last exhibit may not be entered. 8. All artwork is for sale & 30% commission on artwork. Price your work accordingly. 9. NCA Art Gallery reserves the right to reproduce accepted works for press releases & Website. 11. Purchases will be handled by the Conference Center staff. 12. Liability: All reasonable care will be given to works submitted. The NCA Art Gallery & The City of Fairfield Bay representatives will not be responsible for damage or loss. Whatever the cause. Artists should carry their own insurance. 13. Dates: Art Gallery Exhibit- April 10. Mon. – Fri., 9:00 am-4:00 p.m. except for special events then the hours will be extended.